With his soothing voice, impeccable attire, and smooth playing style, John Pizzarelli is a worthy successor to his father, jazz-guitar legend Bucky Pizzarelli. A native of Paterson, New Jersey, John took up the guitar at the age of six. He began playing alongside his father at twenty and ventured out on his own in 1982. John lists Nat �King� Cole and Frank Sinatra as his primary influences. He also holds a special place for the works of Sammy Cahn, Jimmy Van Heusen, and George and Ira Gershwin. While playing all over the world and releasing an extensive catalog of recordings, John has also found time for film and television work including appearances on The Tonight Show, The Late Show with David Letterman, The Today Show, and other popular programs. Renowned jazz guitarist John Pizzarelli shares his take on the key elements of his jazz guitar styles and techniques! Filled with dazzling demos, insightful lessons and great anecdotes, this DVD is perfect for newcomers looking to get their feet wet or for experienced jazzers. Filmed in hi-def with on-screen tab and chord diagrams as well as split-screen close ups of both hands. Lessons include: rhythm guitar comping styles, bossa-nova chord progressions, accompanying a singer, re-harmonizing blues progressions, intros, endings, turnarounds, single note improvised lines, and chord melody soloing. Here's your chance to learn from one of the most exciting jazz guitarists alive today! 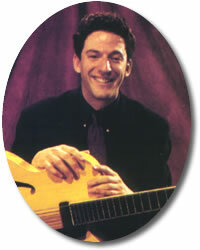 John Pizzarelli Plays "I Got Rhythm"